Thunder Audio Video NEW Store with 30,000+ more products!! 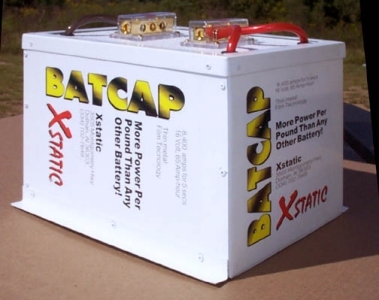 What is a BATCAP©? 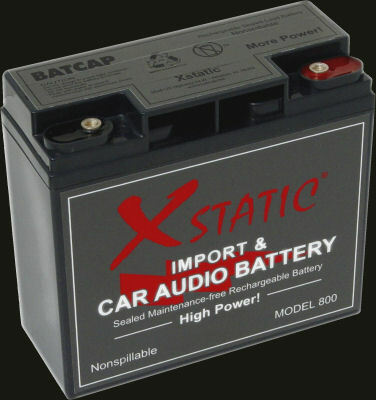 A conventional battery, as we all know has a positive and negative terminal. The chemical reaction within createsa flow of electrons, causing an electronic device (in this case an amplifier) to work. 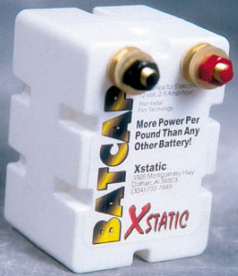 The stiffening capacitor is similarto a battery in that it stores a charge. The fundamental difference is it cannot create electrons. It can only store and supply (discharge) them upon demand. 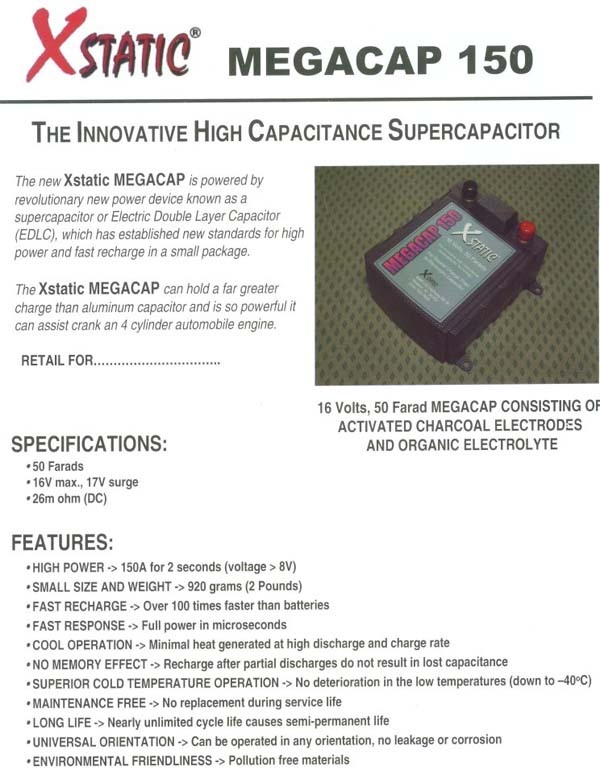 The advantage with a capacitor is that it discharges in one twenty thousandthof a second, unlike a battery that does in one second.The battery therefore cannot discharge fast enough to effectively supply the amplifier and this is the reason for "power sags." WAKE UP! Don't fall asleep just yet, we're getting to the exciting part! 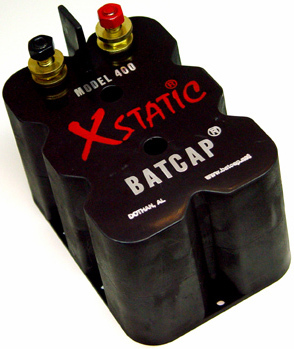 The XSTATIC BATCAP© is simply a battery that can discharge just a s quickly as a capacitor. Therefore, you have a constant supply of electrons that will discharge at lightning speed. 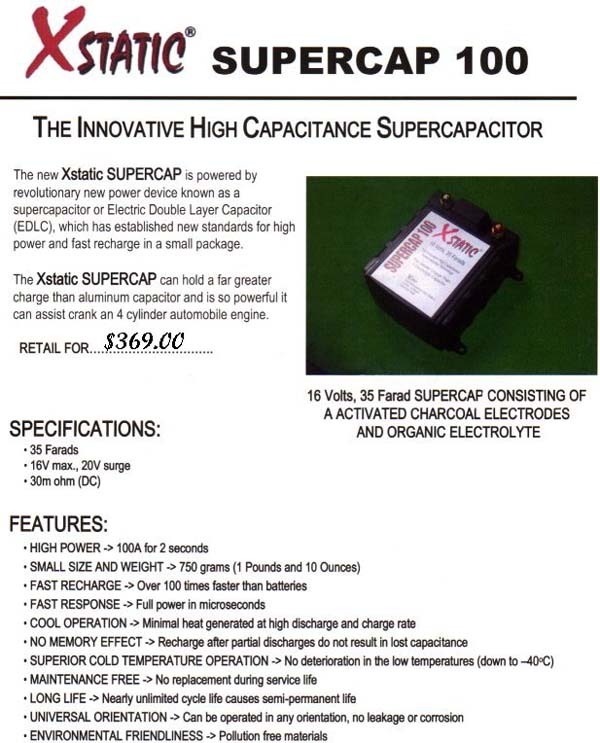 This puts less strain on your stock alternator and battery. It also recharges faster than a conventional battery since the internal resistance is low. How about the install? Well I'm sureyou can find a place to put this 2.5lb. baby and his 5lb. big brother. Don't let the size fool you though. 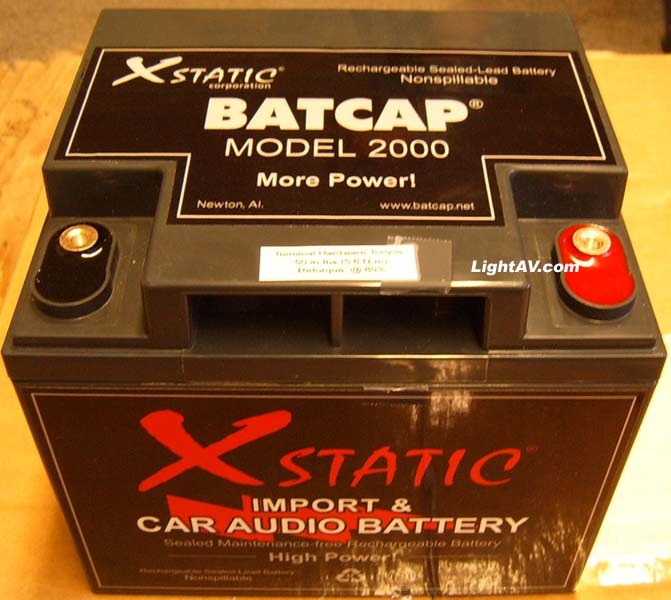 These BATCAP's can crank your car, and you can bet we put that to the test! 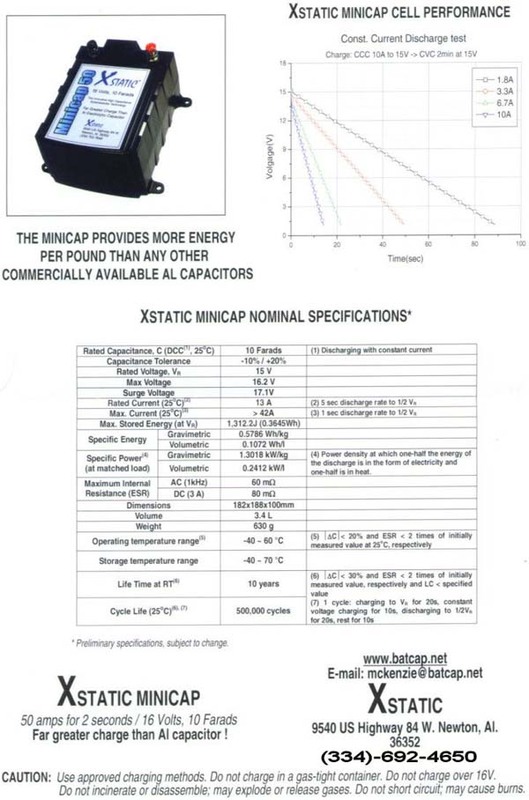 The cost is another remarkable feature since the 300 model costs the same as a "High End" stiffening capacitor and the400 model costs a little more. Remember, "good things come in small packages." (I was going to say that "SIZE" doesn't matter but, let's not offend anyone now.) Oh, by the way, the fact that the BATCAP© is capable of discharging in a RUSH over a 5-10 second period SCREAMS three letters, "SPL!" Meet our new and improved tough guy...Model 800. The Model 800 weighs 14 lbs. and gives you an unbelievable 800 peak amps! Meet our new and improved tough guy...Model 2000. The Model 2000 weighs 34 lbs. 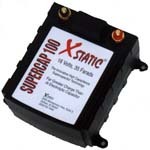 and gives you an unbelievable 2000 peak amps! For those big jobs you may need our 80Ah Model 3000. The Xstatic Corporation lets the Big Dog off the chain! Unleashing our New Model 3000! Weighing in at 58 pounds this bad boys 600 cu in. case is bursting with 60% more energy! Hes ready to be turned lose and show the Car Audio World what he can do! Are you ready for him? 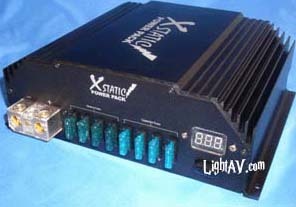 Dimensions: H 8 5/8" X W 6 3/4" X L13"
Two years in the making, the Xstatic Corporation has tried to achieve the energy equivalent of TWO Model 2000s in ONE case! 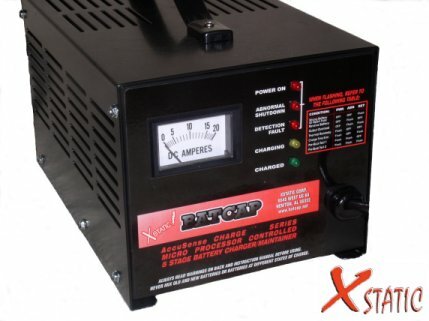 Its here now in the Model 4000, a 12volt, 100ah battery with an internal resistance of 2 m ohm and over 2,000 amps of useable energy. ADVANTAGE? - YOU BET !!! Michael Jones says Batcap is the competitive answer! Michael Jones opened a small shop in Lubbock, TX, in 1997. He soon started to compete in local sound offs around Texas. His goal was to gain credibility and grow his business by excelling on the competition circuit. were limiting the team's quest for bigger SPL numbers. is extremely small was an added plus. 175 dB is old hat now for Jones and his pit crew John Johnson, Jake West and Anthony Jones. •WEIGHS LESS THAN 65 LBS. Eliminates guessing the battery’s condition or State Of Charge by displaying State Of Charge . If a charging error should occur, the Charge Error Condition is displayed using 3 of the 5 L.E.D.’s. 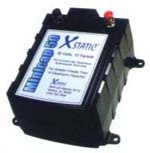 An Ammeter displays real time charging current information. True Microprocessor control, programmed with a proprietary software, applies an I-E-I charge algorithm. Charges at a Constant Current rate until battery voltage reaches the Constant Voltage Mode. Then regulates voltage until battery has reached 100% charge, where it transitions to Float Mode. if batteries have been loaded down by a load. battery drain is much less than 1mA. Dimensions, 6.75 Wide by 5.88 Tall by 10.0 Long. One unit per carton, shipping weight: 32 pounds. Meet the newest player on the Xstatic team! 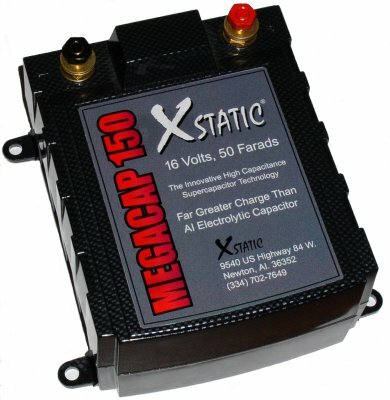 The all new MEGACAP 150!